Please bring in gently used or new books to be donated to our school classroom libraries and the Next Door Foundation. This meet is hosted at South Milwaukee. Slalom @ Heiliger Huegel Ski Hill. Competition at John Long Middle School. For more information please contact Mrs. Uttech @ uttechd@elmbrookschools.org. This meet takes place at Lake Shore Middle School. Please be here on time for the buses. @ SLWC (Sharon Lynn Wilson Center). This time and date is for the CREW of the musical and is subject to change. This time and date is for the CAST of the musical and is subject to change. Please see your coach with questions. See District Website for more information. Activity and class pictures will be taken for the memory book. 6/7/8 GR Orchestra Field Trip to PAC Please see Ms. Shelly Weber w/questions. 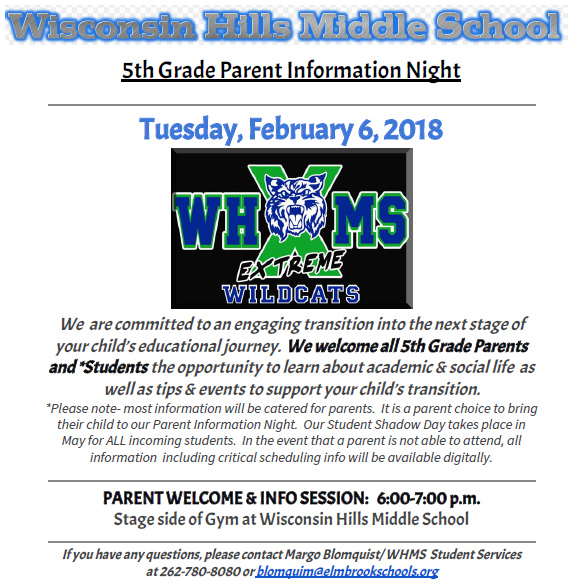 For parents of Incoming 6th Graders 2018-19 Join us for a informational meeting on how to make the transition a smooth one!. 5th Grade Parent Information Night. Stage side of gym at Wisconsin Hills Middle School. Math/Advanced Learners In Building Field Trip. This is the first of the planning meetings for the Fun Run in May. 2nd Grade In School Field Trip - All About Weather. Bring in your SKI equipment - MR. Losey is available only during these hours. Jump Rope for Heart for Third, Fourth & Fifth Graders on February 7 from 3:45 to 5:15 p.m.